Last year, we reached out to members of the estate sale industry. Nearly 10,000 of them, in fact. We presented them with a survey, hoping to gain a better understanding of the business and how it runs. We sought to unlock trends and gain insights into the industry that we could then pass on to our customers, allowing them to see where their company stands on a national level. 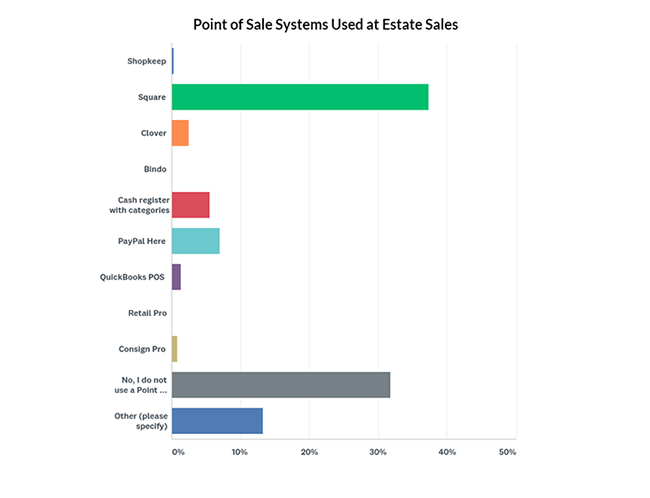 We received over a thousand responses to the survey, which provided us with a much clearer picture of how estate sale and auction companies run, how they treat their clients and run their sales, and how the industry functions as a whole. Now, we’d like to share those findings with you. What type of sales do you conduct? 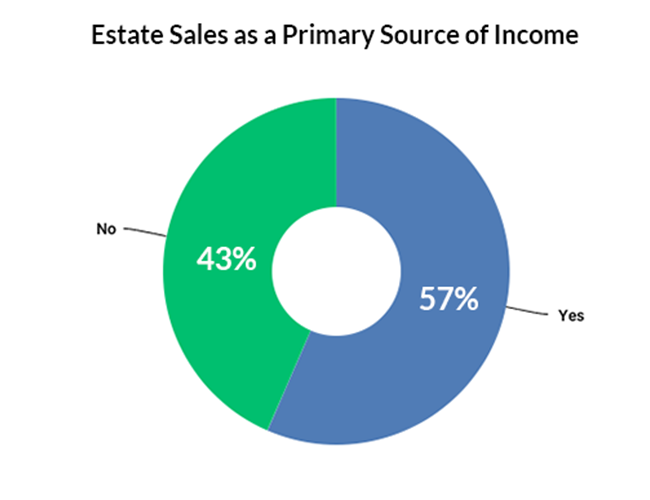 The industry does not limit itself to estate sales alone, though that is, unsurprisingly, how the majority of our survey respondents run their businesses. 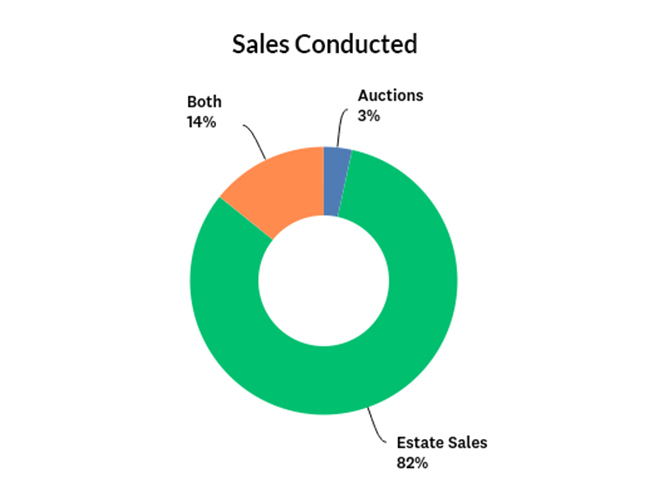 Of them, 82.37 percent conduct liquidations through estate sales only, but 14.2 percent choose to get the job done through both tag sales and auctions. Another 3.43 percent of respondents focus on auctions only. Those who run the companies tend to have at least some college education, with 31.32 percent of respondents claiming to have attended some college, and 37.25 percent completing their undergraduate education. Another 14.07 percent completed graduate school. Is your estate sale business your primary source of income? Interesting to note is that a considerable number of these businesses (56.53 percent) are the primary source of income for the people who own them. For 43.47 percent, it’s purely supplemental. 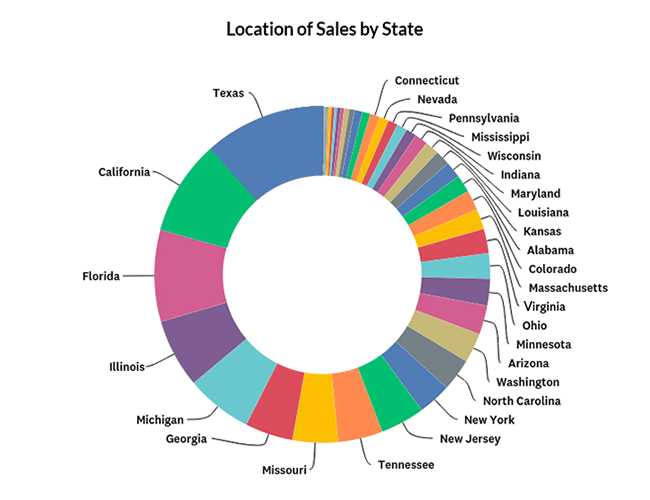 In which state are most of your sales located? The businesses these women and men run are, of course, spread all across the country, but there are definite areas of higher concentration: Texas, California, Florida, specifically, with over 100 responding companies in each. Montana, Vermont, Utah, South Dakota, Alaska, and Hawaii had no respondents. 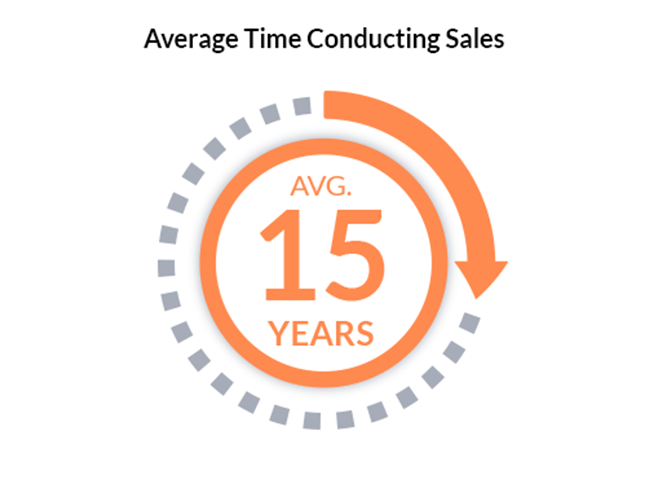 How many years has your company been conducting sales? The industry, it seems, has staying power. The responding estate sale and auction companies have stayed in business, on average, for 15 years. There are 17,769 years of combined experience among all the respondents. Does your company currently have a business license? How people choose to run their businesses is a matter of personal preference, but it’s also a matter of what their state and local laws require. 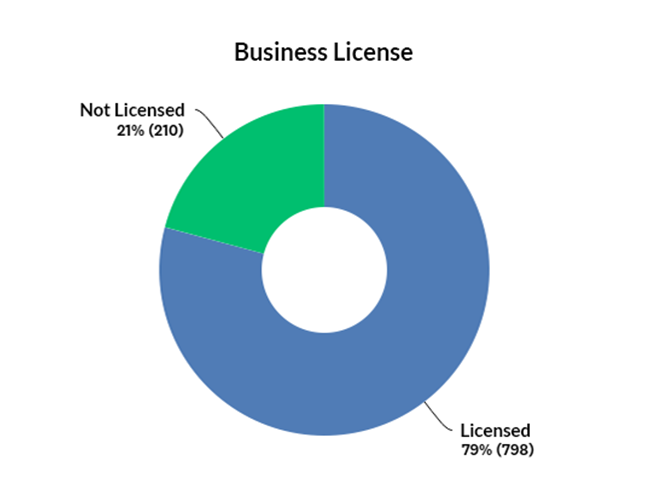 For example, 79.17 percent of responding companies are operating with a business license, while 20.83 are not. Depending on where the company is based, they may not be required to carry one. How much staff (including yourself) do you typically have on hand during each sale? 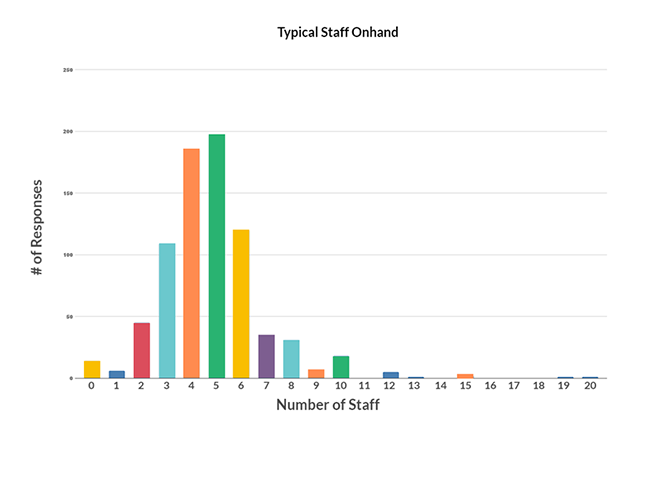 The number of staff responding companies employ varies considerably, reaching as high as 20. The average staff size, however, is 4.818. Does your company currently have liability insurance? 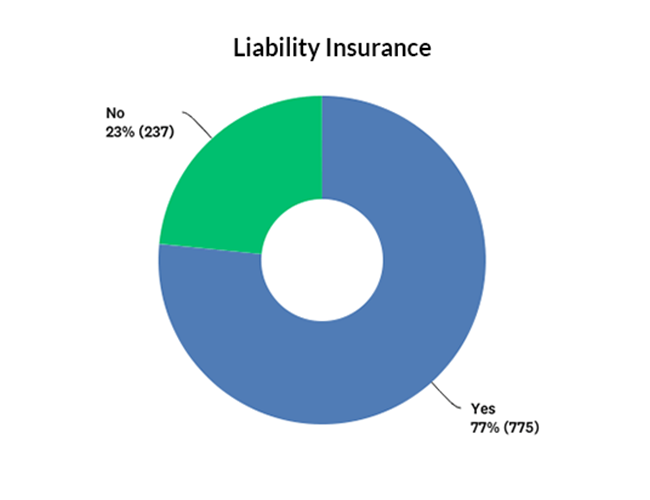 When it comes to insurance, the majority of companies—76.58 percent—carry liability insurance, while 23.42 percent do not. Is your company currently bonded? 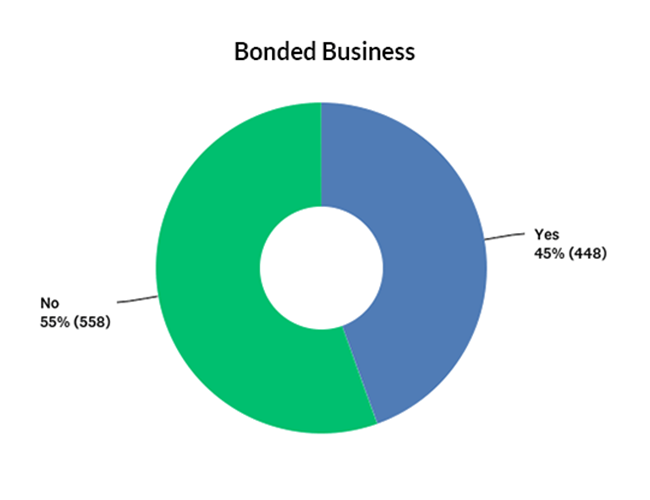 The difference is split more evenly on the subject of bonding; 55.47 percent of companies are not currently bonded, while the other 44.53 percent of companies are. Do you provide references to potential clients? 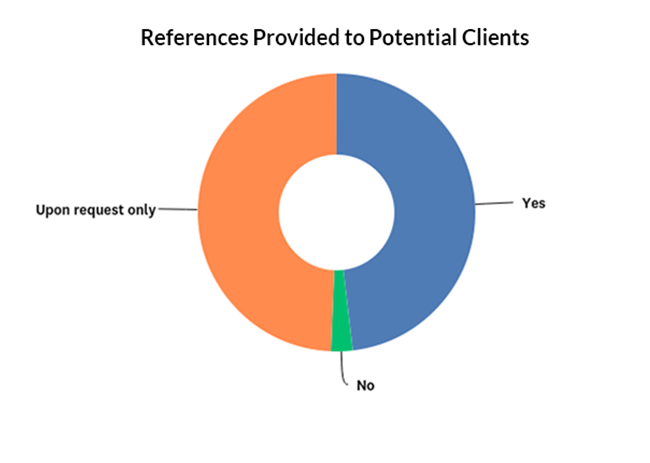 When working with potential clients, almost all companies provide references, either upon request (49.35 percent) or without prompting (48.14 percent). A small minority—2.51 percent—said they do not provide any references. Do you use a Point of Sale system? If so, which one? The majority of respondents use Point of Sale systems like Square (the most popular, at 37.31 percent) or PayPal Here (6.98 percent). Such systems, also known as retail management systems, offer businesses inventory management services, barcode creation, the ability to offer printed and digital receipts to their customers, among other things. Regardless, 31.85 percent of businesses choose not to use POS systems. Does your company take items on consignment? 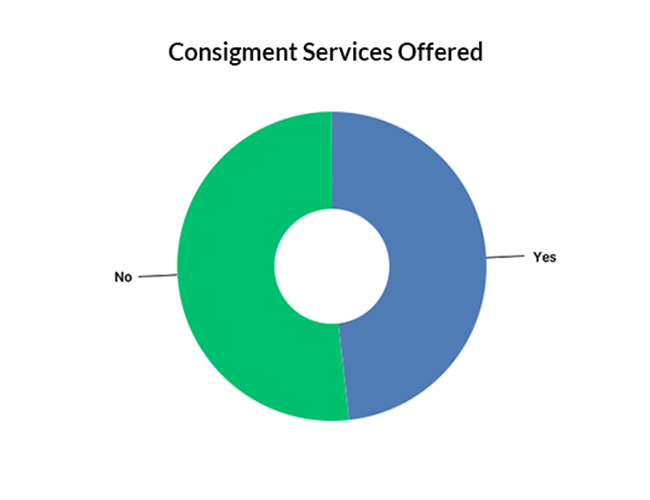 The topic of consignment is split relatively evenly down the middle, with 48.24 percent of respondents taking items on consignment, and 51.76 percent electing not to. Do you own a consignment shop? 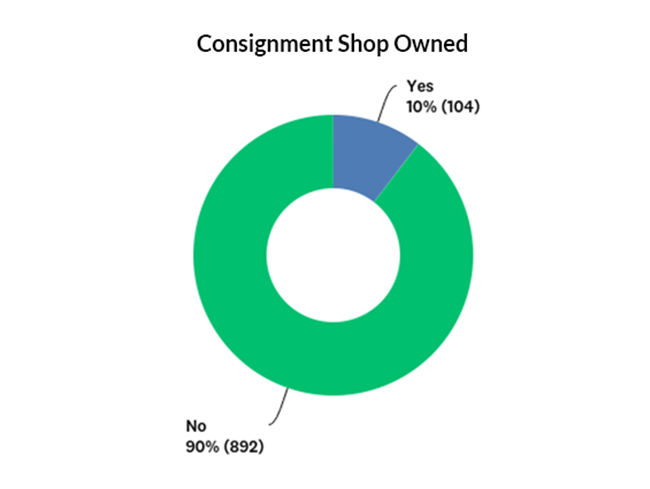 Although nearly half of companies accept items on consignment, only 10.44 percent of them own a consignment shop. What accreditations or memberships, if any, does your company have? Estate sale and auction companies often use accreditations and professional memberships in order to set themselves apart from their competition. More than half of responding companies (53.38 percent) hold some sort of accreditation. 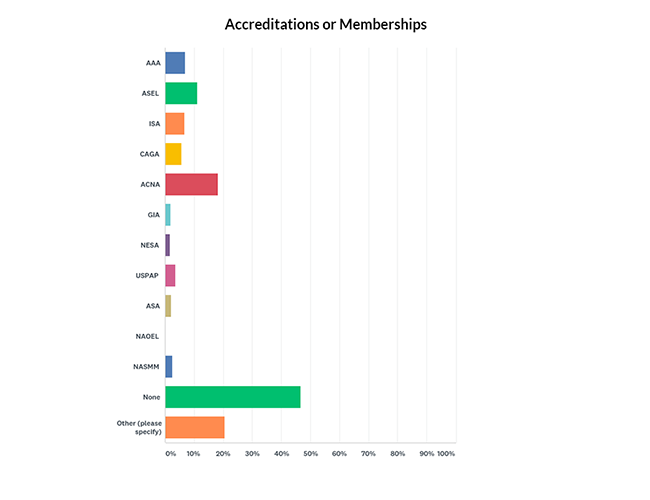 Altogether, respondents listed nearly 100 professional organizations and associations with which they are affiliated, through membership or accreditation. They include various auctioneer and estate sale associations, realtor associations, and bar associations. Are you a certified appraiser? In addition to these professional affiliations, most companies (60.52 percent) utilize the expertise of a certified appraiser. 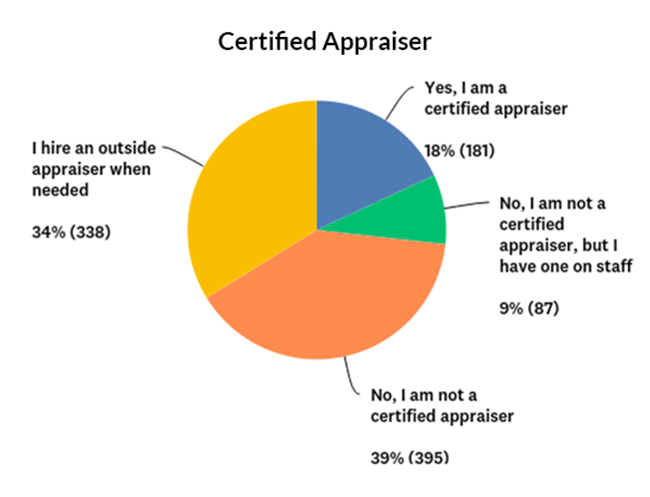 Many business owners (18.08 percent) are appraisers themselves, while 8.69 percent have an appraiser on staff. Another 33.77 percent hire an outside appraiser when one is needed. What source(s) do you use to price your items? Whether or not they have a certified appraiser onhand, estate sale and auction companies use a number of other resources to price their items, eBay is the most popular, cited by 89.15 percent of respondents. 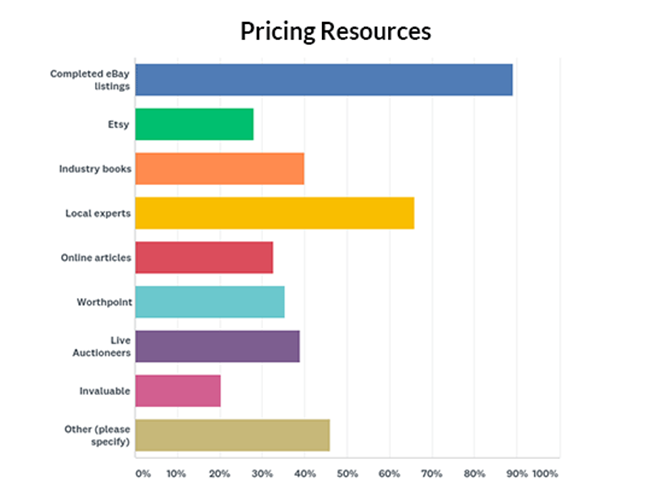 Etsy, Worthpoint, Live Auctioneers, Invaluable, and various online articles were also popular online sources. Offline, 65.97 percent of respondents seek out the advice of local experts, and 40 percent utilize industry books. Do you require a signed contract for each sale? When taking on and working with a client, strategies vary considerably. 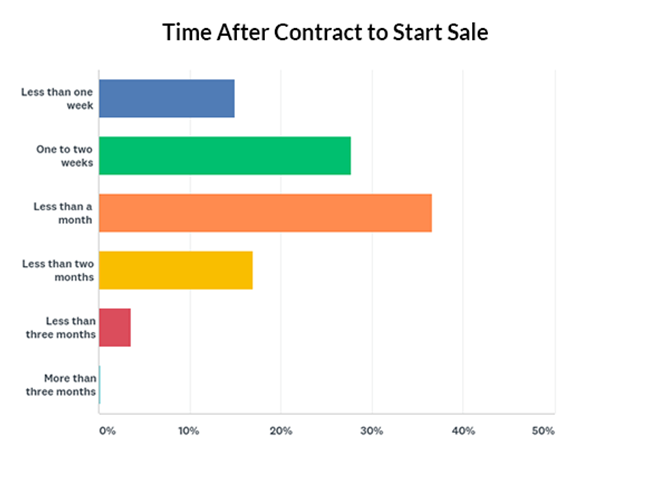 As one would expect, the majority of companies require a signed contract before taking on a sale, but five percent of respondents said they did not. 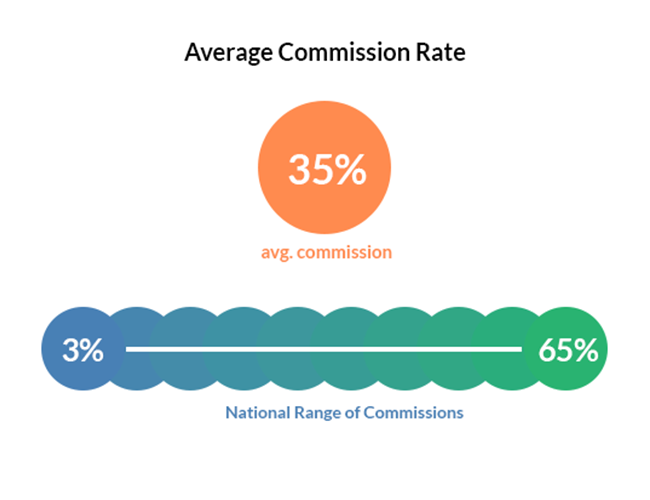 What is your average commission rate? The average commision rate for estate sales was 34.8 percent, though the rates ranged from as low as three percent to as high as 65! Do you charge your client any fees outside of commission? 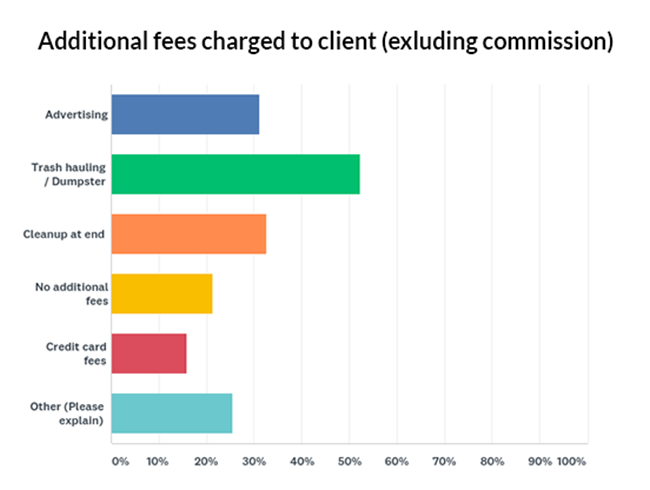 In addition to commission, it’s not uncommon for companies to charge their clients other fees as needed. These can include advertising (31.2 percent of companies charge for this), trash hauling (52.28 percent), clean up (32.65 percent), credit card fees (15.84 percent), or what was categorized as “other” (25.56 percent), which includes things like appraisals, shipping, staging, traffic control, security, and supplies. 21.28 percent of companies do not charge any additional fees. How soon after a client's contract has been signed do you typically start their sale? 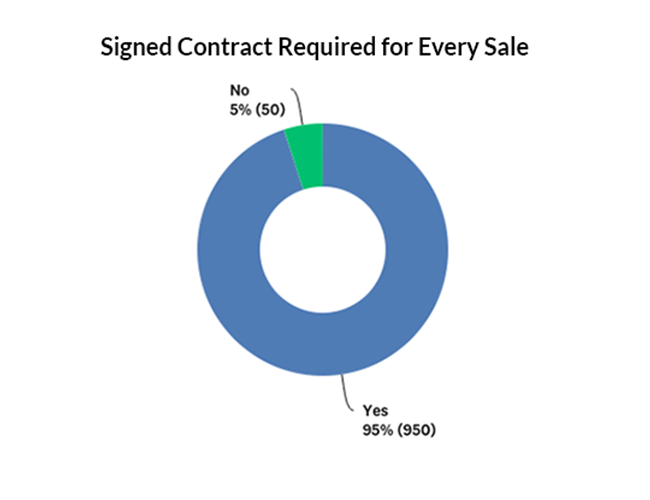 Most companies (79.27 percent) hold their sales within a month of obtaining a signed contract. Only 16.29 percent start their sales within two months, and 3.56 percent start their sales within three months. The date of a sale is typically determined by the client and how fast he or she needs to sell their items. But for some companies, it’s difficult to run a short-notice sale, due to scheduling or the lack of time to advertise. Do you share your sales on social media? When it comes to promoting sales, most companies use social media—only 16.3 percent of respondents choose not to. Facebook is the most popular outlet (82.9 percent), followed by Instagram (21.93 percent) and Twitter (19.22 percent). Google+, Pinterest, and Reddit are also used. Does your company have an email subscriber list? 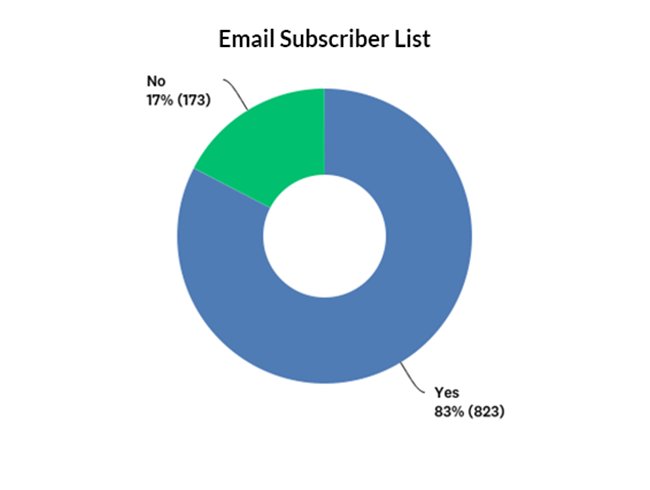 The majority of respondents (82.63 percent) use an email subscriber list to spread the word about their upcoming and ongoing sales as well. 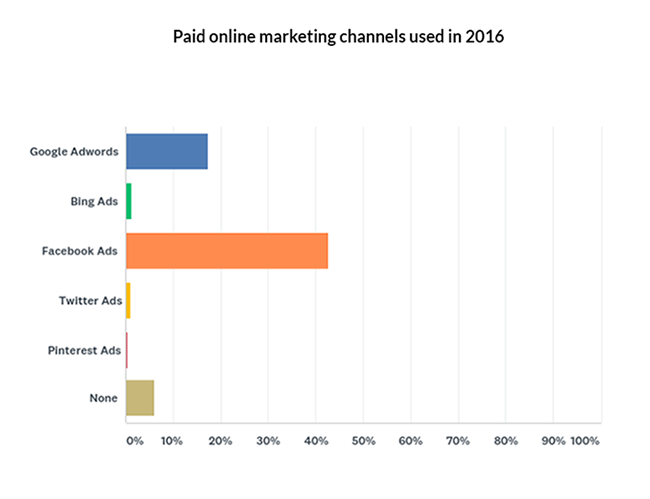 Which paid, online marketing channels did you use in 2016 to advertise your company? 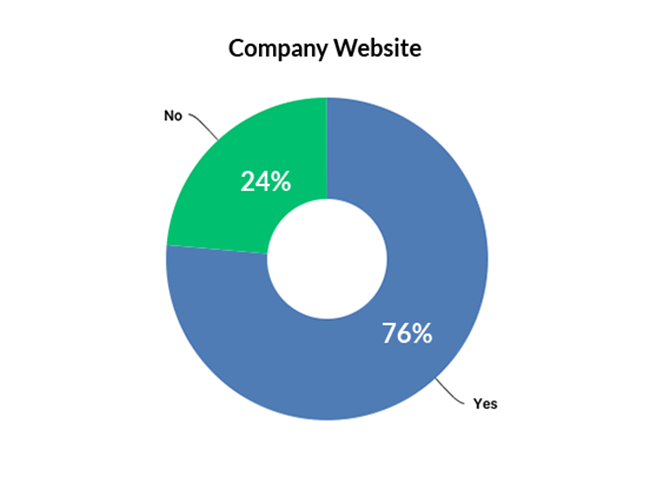 Respondents also use digital advertising channels to promote their companies. 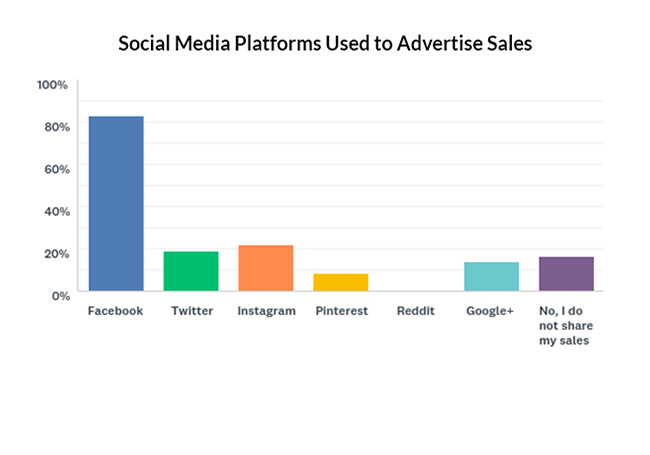 These include Facebook ads (46.66 percent), Google Adwords (17.4 percent), Bing Ads (1.21 percent), Twitter Ads (1.11 percent), and Pinterest Ads (.4 percent). A few—6.14 percent—companies opted to use no paid online marketing channels. Most responding companies (76.39) currently have a website. The other 23.61 percent do not. 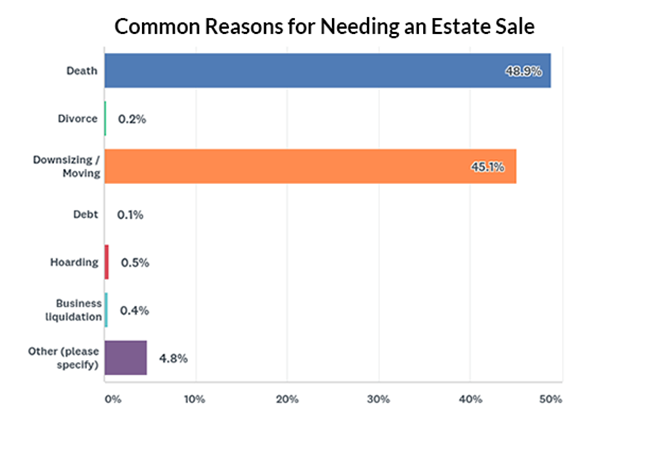 What is the most common reason your clients need an estate sale? There’s a saying that the reason people hold estate sales is because of the 3 Ds: Death, Divorce, and Downsizing. 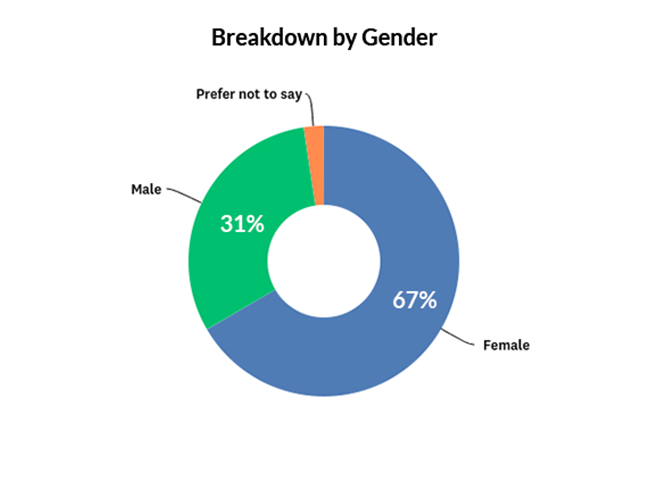 But based on our survey results, we may have to modify that. Death, at 48.89 percent, and downsizing or moving, at 45.09 percent were clearly the most prevalent reasons people hold estate sales, but the other reasons were much less common, and there were two of them—hoarding (.53 percent) and business liquidation (.42 percent)—listed before divorce ever comes into the picture at .21 percent. But, we suppose, any other option wouldn’t have the same ring to it. 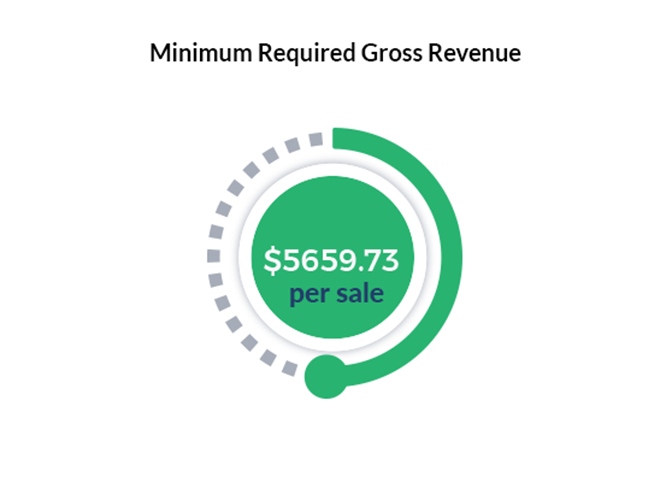 What is the smallest sale your company would be willing to take (in gross revenue of sale)? Estate sale and auction companies have different ideas on how small is “too small” when it comes to accepting a sale. Once we removed a few outlier responses on either end of the spectrum ($0-$100, $600,000 and $1,000,000), we found the smallest sale respondents were willing to take on was, on average, $5659.17. 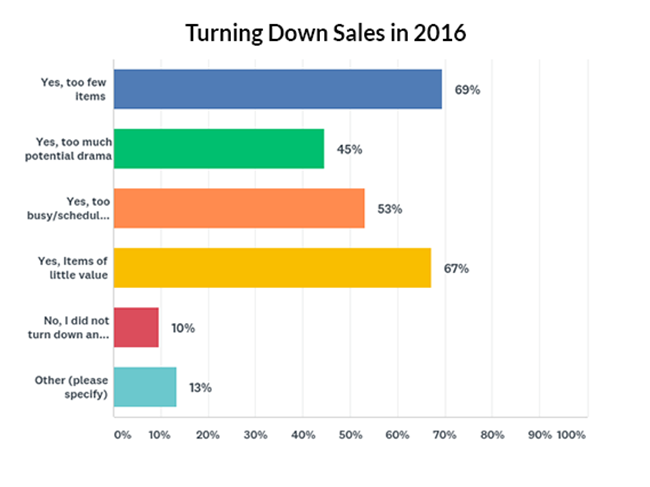 Did you turn down any sales in 2016? Sales were turned down for a variety of reasons in 2016, most commonly because there were too few items available for the sale (69.37 percent) or because the items had too little value (57.17 percent). Scheduling issues (53.15 percent) and the potential for drama (44.54 percent), were the other most common reasons. A small number of companies (9.61 percent) never turned down a sale. 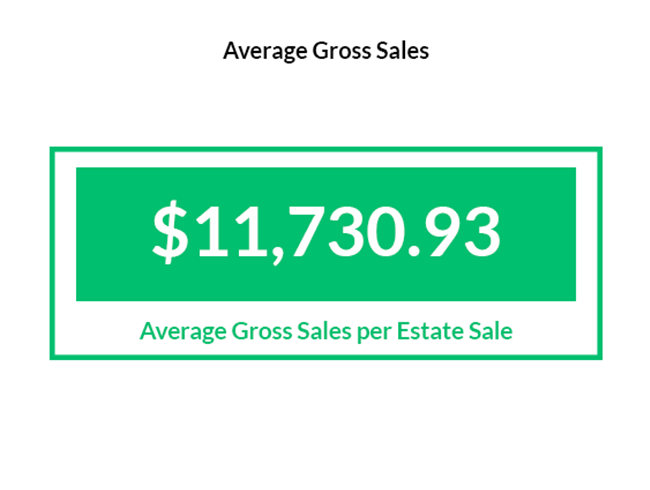 On average, what are your total gross sales for an estate sale? When all is said and done, the average gross sales for an estate sale amount to $11,730.93. This was after removing outliers who reported sales over $150,000 per sale, or anything under $600. After the contract is signed, do you allow the client or the client's family members to remove items from the home? The policies of estate sale companies, as far as their clients are concerned, can also vary considerably. A common issue for businesses is how to handle clients who want to remove items from the home after the contract is signed. Most companies (64.45 percent) allow this to happen—33.54 percent do not—but even then, their policies vary. 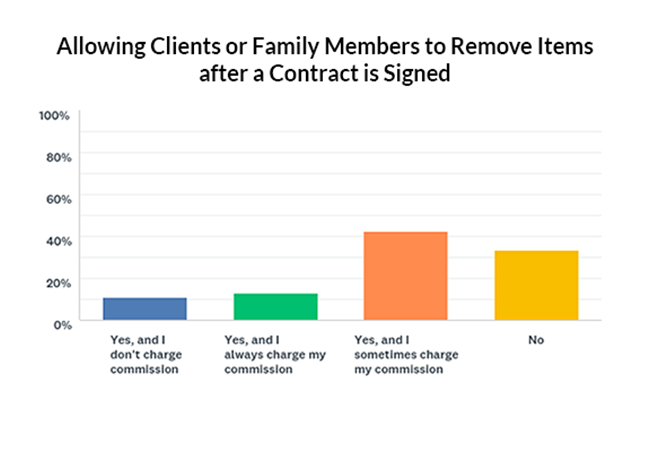 The majority of companies that allow clients to remove items do not have a hard-and-fast rule about whether to charge commision on those items. A smaller number (around 19.3 percent), always charge commission. A smaller number still (16.72 percent) never charge commission. What do you do with found cash? 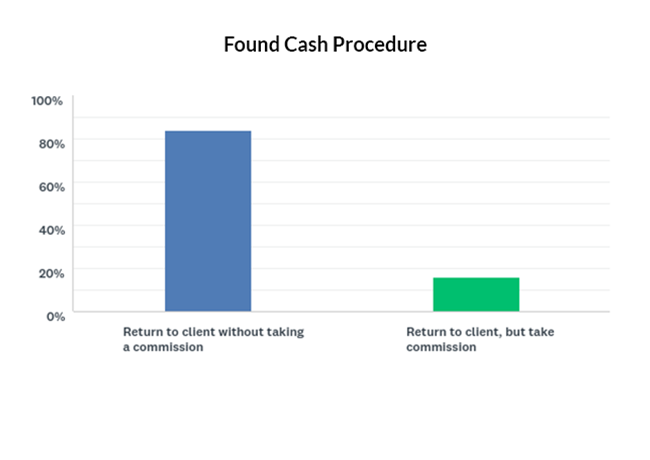 A commission is, by and large, not charged when it comes to found cash on the client’s property. Should a company come across money left behind while preparing for a sale, only 16.21 percent of them take commission from it before returning it to the client. When companies post pictures online, they will, naturally, have customers interested in their items, and perhaps those customers will even ask to purchase the item before the sale takes place. For 70.67 percent of companies, this is not allowed. 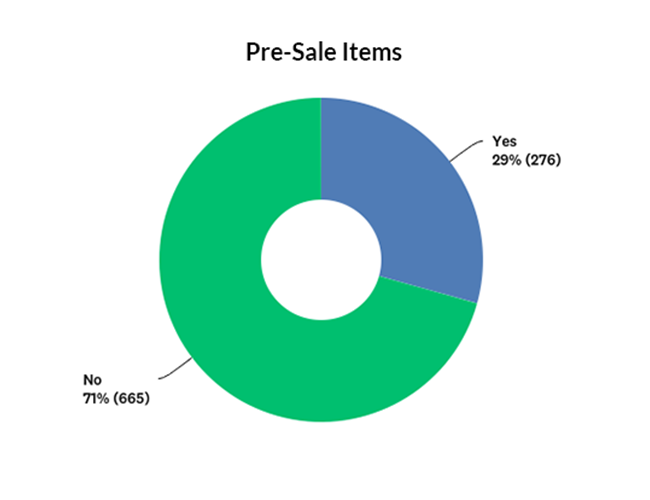 But 29.33 percent of them are willing to pre-sell items. Do you allow early entry into sales? But when it comes to letting customers in early on the day of the sale, companies are less lenient. 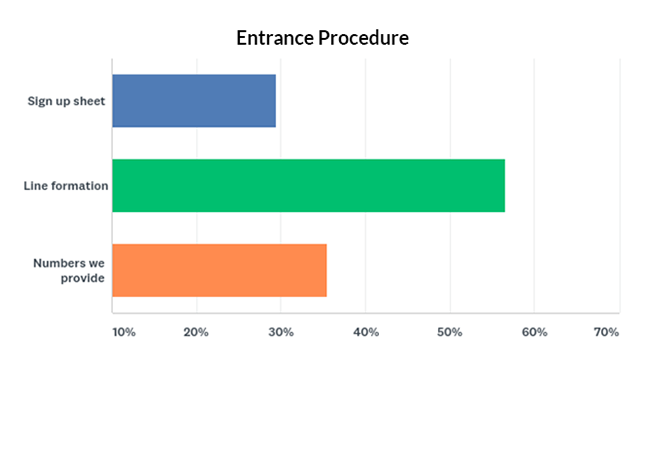 Only 9.41 percent of them open the doors ahead of the scheduled time. What procedure do you use to let buyers into your sales? For those customers who do get to the sale early, ready to pounce once the door opens, companies provide different ways of making sure the first moments of opening day are orderly, and that every customer gets their turn. A basic line formation is most common, with 56.57 percent of businesses utilizing this method. Another 35.5 percent of companies provide line numbers to their awaiting customers, while another 29.42 percent put out a sign-up sheet to maintain order. Do you allow your clients to attend their own estate sales? Once the sale begins, there is the matter of whether clients are allowed to attend their sale. The preference is to have the client off the premises for the sale. Estate sales can be an emotional time for a client, which can be distracting to customers. 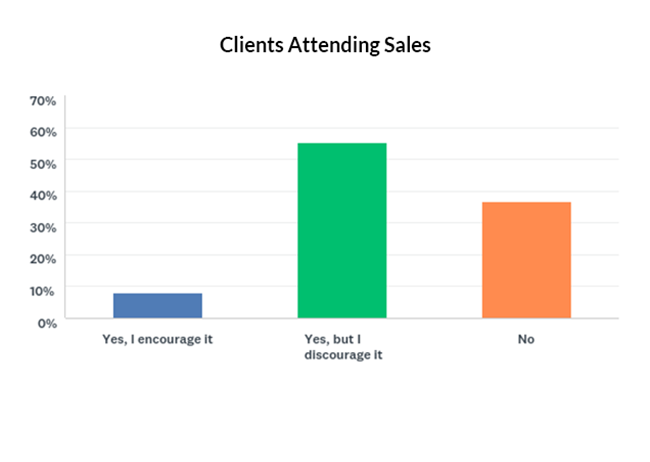 So 36.6 percent of companies do not allow clients to attend their own sales, while 55.38 percent simply discourage it. But there is a small percentage—8.02 percent—that encourage their attendance. 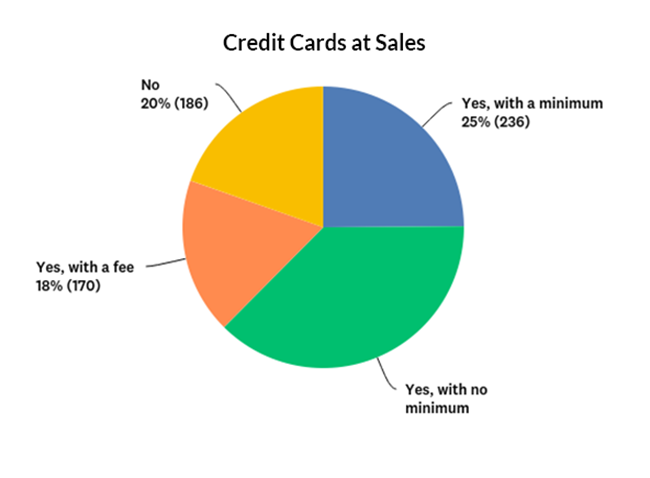 Not surprisingly, most companies—80.37 percent—accept credit cards. Of those companies, most—46.72 percent—do so without stipulation. Almost 31 percent require a minimum purchase, and 22.31 percent charge a convenience fee. Do you collect sales tax at your sales? 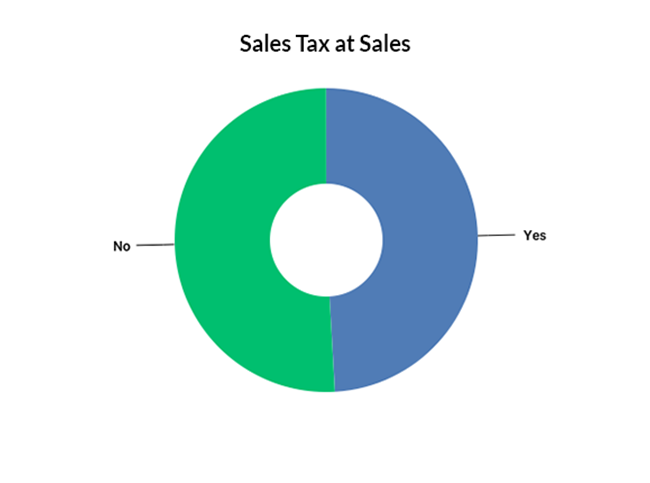 Matters of sales tax are split nearly down the middle, with 49.09 percent of companies collecting sales tax, and the other 50.91 percent not doing so. This is to be expected because the laws are different in each state, so not every company is required to collect or submit sales taxes. 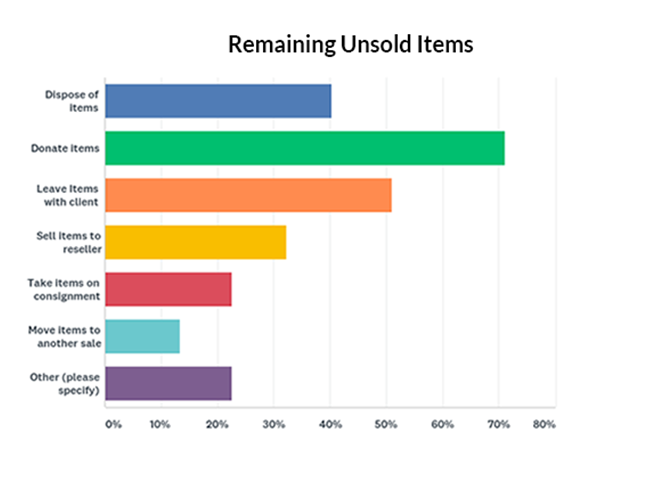 What do you do with unsold items when the sale is over? When the sale is over, companies must decide what to do with the unsold items. They take a number of tactics, including donation (71.17 percent), leaving the items with their clients (51 percent), disposing of them (40.34 percent), selling them to a reseller (32.31 percent), taking the items on consignment (22.6 percent), or moving the items to another sale (13.41 percent). 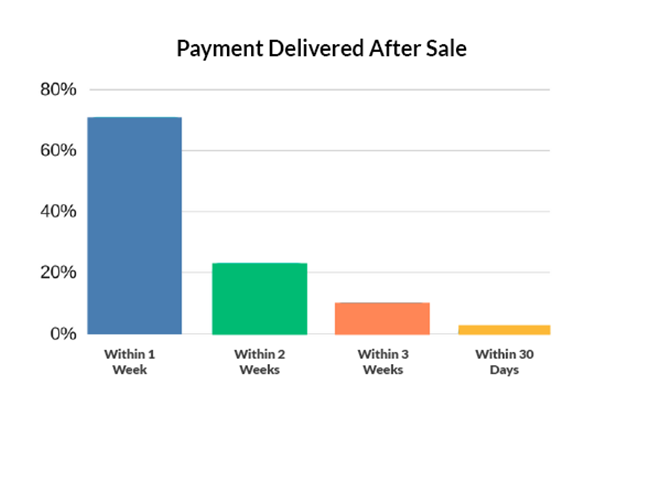 How many days after a sale has ended do you typically pay your client? Most companies (71 percent) pay their clients within a week following the sale, the average being 6.78 days. When we break it down, we find 4 percent reported their clients are paid the day of the sale, and another 6 percent on the day after. Almost 23 percent of companies pay their clients two weeks after the sale, 9.85 percent wait until three weeks, and another 2.35 percent pay them 30 days after the sale has ended.